To sum it up, President Clinton issued an executive order that the Forest Service would keep all the non-wilderness, but yet roadless areas on the national forests, free of new permanent roads. There were a number of court challenges filled to this by states like Wyoming and Idaho. They had mixed success. Then, new President George W. Bush rescinded the roadless area protection rule. More court cases were filed, and eventually the Administration said the states could petition a special committee to adopt a state-created plan to manage the roadless area for various development and retention purposes. Idaho was the only state to do this. The plan was created and adopted by the committee. Most of the rest of the states, but not Wyoming, said “keep the roadless areas, roadless”. Then a California district judge ruled the whole Bush enterprise invalid, restoring the Clinton rules, but Wyoming is going to its favorite judge, Clarence Brimmer of the Wyoming federal district, to try to invalidate the California judge, at least for Wyoming. The result could be a different “law” for the 9th Circuit Court of Appeals and the 10th Circuit Court. California, Montana, New Mexico and Oregon have formally intervened in the case arguing that Wyoming’s case threatens them. Here is the AP story: States line up against overturning roadless rule. In Idaho’s Pioneer Mountains roadless area. 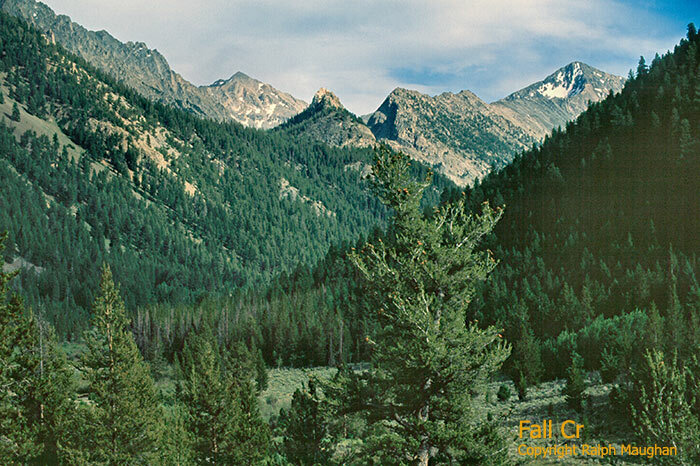 Fall creek canyon. Before the Bush adminstration’s planning rule (separate from the Clinton roadless rule) was overruled, also by a California judge, the State of Wyoming’s so-called Democratic Governor Dave Freudenthal funded a “government cooperator’s work group” to “advise” the Shoshone National Forest on its plan revision. This group is made up of county commissioners, members of conservation districts, and members of various state agencies. Freudenthal also funded a private consulting firm to help out the work group. We, the public, had no funding to support our involvement in the planning process, nor any real influence over the work group or the process. The primary consequence of the work group’s influence over the planning process is limited wilderness recommendations and a plan to open up many roadless areas to salvage logging, which would also have the effect of creating more ORV trails in currently roadless areas. Wyoming’s opposition to the roadless rule is simply is part of the larger determination to support “local” demands to open up the Forest to unsustainable uses, where “local” means only those locals who support multiple use, not those many locals, not to mention other American citizens, who are more demanding more ecologically aware management of the Forest. Pray for us. We have had Bush style natural resource management in Wyoming for decades. Our Republicrat Governor is just the latest manifestation of doing things for special interests, not the public interest. Thanks, I didn’t know that, Robert. In Idaho the county commissioners were asked to send recommendations to the governor. Some of them held public hearings, but I don’t think the public had any real influence. Idaho’s plan is not awful as long as the Forest Service doesn’t get much money to conduct below cost timber sales. Eastern Idaho fared the worst by far, probably because it is suspected some of the areas could possibly harbor natural gas.